The life and times of a one woman show! Married mom of two and her creative explorations with business and family. Contains links to Susan's blog, photos and site. 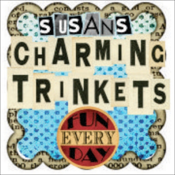 As well as links to Twitter and Facebook for easy access to keep up to date with all things Susan. Grab Susan's head on the initial screen and move it around. Swipe your finger across screens (without touching the head on the first screen) to move back and forth, or use the Back button if one is provided. Touch the left and right sides of the bottom of the image show to change pictures in the showcase.